Definition: The Opinion Poll Methods are used to collect opinions of those who possess the knowledge about the market, such as sales representatives, professional marketing experts, sales executives and marketing consultants. Expert-Opinion Method: Companies with an adequate network of sales representatives can capitalize on them in assessing the demand for a target product in a particular region or locality that they represent. Since sales representatives are in direct touch with the customer, are supposed to know the future purchase plans of their customers, their preference for the product, their reaction to the introduction of a new product, their reactions to the market changes and the demand for rival products. Thus, sales representatives are likely to provide an approximate, if not accurate, estimation of demand for a target product in their respective regions or areas. In the case of firms, which lack in sales representatives can collect information regarding the demand for a product through professional market experts or consultants, who can predict the future demand on the basis of their expertise and experience. Although the expert opinion method is too simple and inexpensive, it suffers from serious limitations. First, The extent to which the estimates provided by the sales representatives or professionals are reliable depends on their skill and expertise to analyze the market and their experience. Secondly, There are chances of over or under-estimation of demand due to the subjective judgment of the assessor. Thirdly, the evaluation of market demand is often based on inadequate information available to the sales representatives since they have a narrow view of the market. 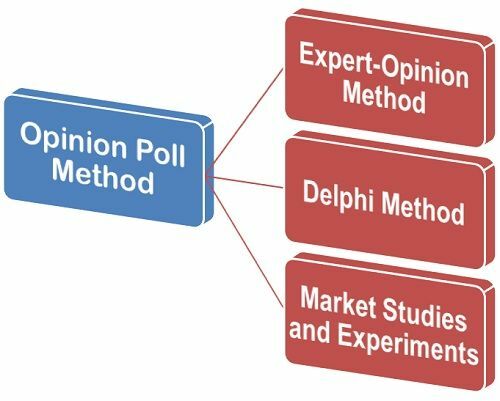 Delphi Method: The Delphi method is the extension of the expert opinion method wherein the divergent expert opinions are consolidated to estimate a future demand. The process of the Delphi technique is very simple. Under this method, the experts are provided with the information related to estimates of forecasts of other experts along with the underlying assumptions. The experts can revise their estimates in the light of demand forecasts made by the other group of experts. The consensus of experts regarding the forecast results in a final forecast. Market Studies and Experiments: Another alternative method to collect information regarding the current as well as future demand for a product is to conduct market studies and experiments on the consumer behavior under actual, but controlled market conditions. This method is commonly known as Market Experiment Method. Under this method, a firm select some areas of representative markets, such as three or four cities having the similar characteristics in terms of the population income levels, social and cultural background, choices and preferences of consumers and occupational distribution. Then the market experiments are carried out by changing the prices, advertisement expenditure and all other controllable factors under demand function, other things remaining the same. Once these changes are introduced in the market, the consequent changes in the demand for a product are recorded. On the basis of these recorded estimates, the elasticity coefficients are calculated. These computed coefficients along with the demand function variables are used to assess the future demand for a product. The alternative method to market experiments is the Consumer Clinics or Controlled Laboratory Method wherein the consumers are given some money to make purchases in stipulated store goods with different prices, packages, displays, etc. This experiment displays the responsiveness towards the changes made in the prices, packaging and a display of the product.One of the major limitations of market experiment method is that it is too expensive and cannot be afforded by small firms. Also, this method is based on short-term controlled conditions which might not exist in the uncontrolled market. Therefore, the results may not be applicable in the long term uncontrolled conditions. Thus, these are some of the opinion poll methods that are used to gather expert opinions of those who are closely related to the market with an aim to estimate a future demand for the product.